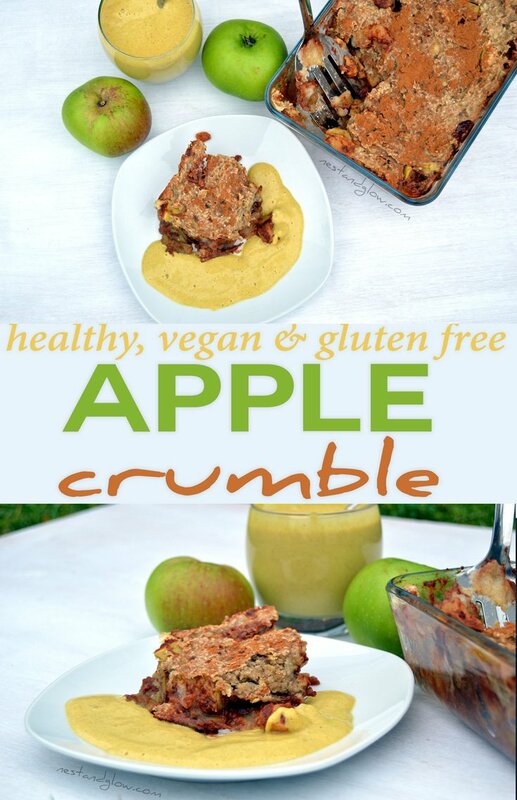 This easy to make healthy apple crumble uses bananas and oats to give a crispy and chewy topping. No sugar is added and all the sweetness comes from fruit. There is no butter or oil added in this vegan recipe but the raw cashew custard gives a rich dairy-free sauce that is loaded with vitamins and minerals. Turmeric has many health properties such as a blood purification, anti-inflammatory and more that are not yet fully understood. This recipe is a great way to get more turmeric into your diet. You don’t taste the turmeric, but it helps give the raw custard a golden colour. If you’re trying to eat more raw foods this recipe is great as the crumble is cooked but the custard is raw. I grind gluten-free oats to make the topping but it’s important to choose oats that crumble easily as they give the right texture. I find it best to avoid the jumbo oats that are quite firm as they don’t break up into a fine powder. Blend together the dates, vanilla, cinnamon and water for the crumble until smooth. Core the apples and cut into small chunks, roughly 2cm in size. You can peel the apples if you prefer a smooth texture. I keep the peel on, as it contains many of the nutrients. 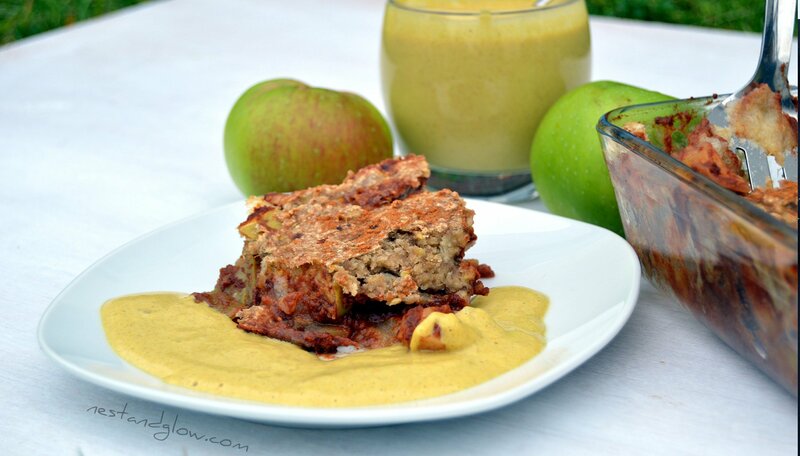 Mix the apples and date paste together and put in a baking pan. Grind your oats into a fine powder using a coffee grinder or small blender jug. You can use instant oats instead of grinding. The volume of 1½ cups is for the whole oats. Mash the bananas and mix with the ground oats and then spread on top of the apple mixture. Bake at 350 F / 180 C for 35-40 mins until the top is golden brown. Blend together all of the custard ingredients until smooth. You may want to blend for a few mins to make the custard warm or instead use warm water. Serve as soon as the apple crumble comes out of the oven. Keep leftovers in the fridge where they will last a few days. This was a great dish easy to make and delicious thank you Bastian. What kind of Nutribullet do you use? 1700 W or 600 W, the cheapest? When do we add the cinnamon? Its in your ingredient list but not in the cooking instructions. i didn’t add the cinnamon. i hope it still tastes good.